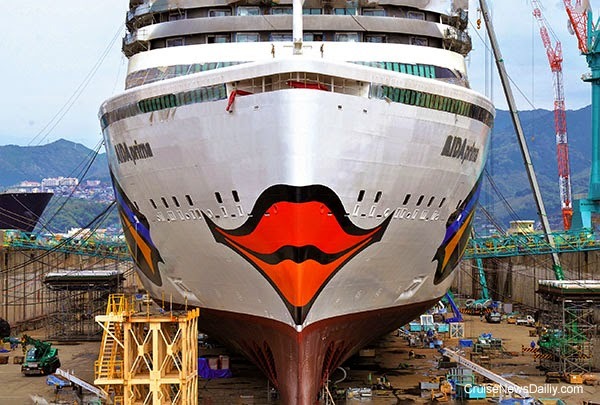 Ships have several milestones when they are being built, such as the float out, or the installation of the funnel, but AIDA ships have another milestone - the day they get their artwork on the bow - the trademark lips, eyes and waves. AIDAprima is under construction at the Mitsubishi yard in Nagasaki, and it has passed just such a milestone. The complete story appeared in the April 10 edition of Cruise News Daily. The resignations and other changes, of course, are related to Genting's acquisition of Crystal Cruises, a major competitor of NCLH's top tier brands. Details appear in the April 10 edition of Cruise News Daily. 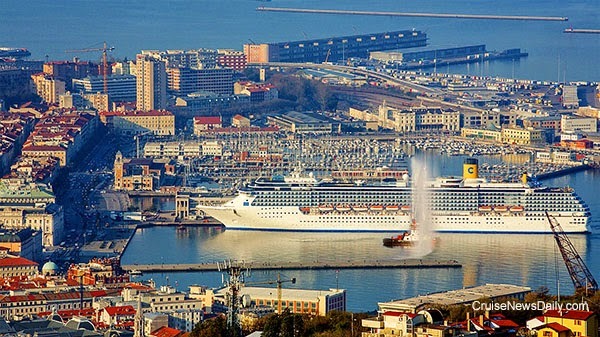 Costa has opened a new home port in Italy - Trieste. Costa Mediterranea is shown here arriving the port on Friday for the first of 33 cruises during the summer season. Details appeared in the April 10 edition of Cruise News Daily. Meyer Werft delivered the 167,800-ton Anthem of the Seas to Royal Caribbean today at Bremerhaven. The ship is the second in the Quantum-class. Shown below are the two companies' senior officers and the ship's top officers wishing they had worn their heavier coats while Richard Fain speaks. The production shows aboard Disney Cruise Line are a big deal, more so than on other cruise lines, because they appeal every passenger - from the kids to the adults. They’re a highlight for everyone. So when a new show is created and introduced, it comes highly anticipated, and Disney has announced a new show is set to debut aboard Disney Magic in November. The complete story appeared in the April 9 edition of Cruise News Daily. Get ready. It appears that if you want the privilege of dining in your robe or underwear on some mass market lines, you may have to start digging down in your pocket. (Note to self: shop for underwear with pocket.) Several lines have started charging for room service, in one way or another. They all have justification for it, and much of it seems reasonable. In this CND article we look at what the cruise lines are doing and the different sides of the issue. Costa Cruises is just as confident of their product as sister line Carnival is. Costa has launched a money back guarantee, a first in the Italian market, modeled after Carnival’s Vacation Guarantee. The new guarantee is the centerpiece of Costa’s new marketing program in Italy targeting potential customers who have never cruised. 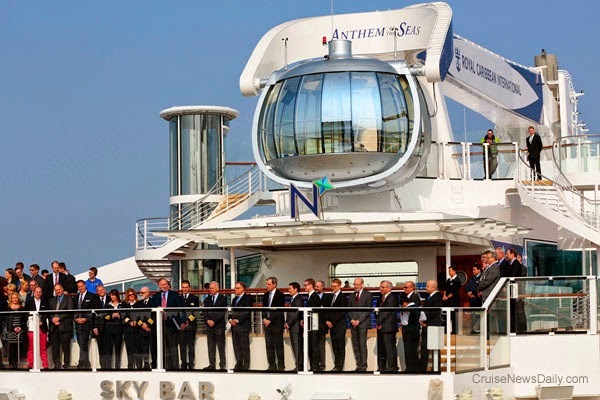 The complete story appeared in the April 7 edition of Cruise News Daily. Last week you read about Norwegian Star returning from dry dock with lots of new features. We also mentioned that among the work done below decks was a new hydrodynamic upgrade installed on the Azipod propulsion system. It mustn’t be working as well as planned. Norwegian said today they are canceling the ship’s April 12 sailing so it can go into dry dock in the Bahamas for repair. The problem is not affecting the ship’s current Mexican Riviera sailing. Details appeared in the April 7 edition of Cruise News Daily. This morning, Pacific Dawn became the first cruise ship to bring passengers to Port Vila since Cyclone Pam devastated Vanuatu on March 13. The 1800 passengers were greeted by something of a carnival atmosphere with a band on the dock, turning the arrival into a celebration. A few years ago, the State of Alaska began imposing a relatively large tax on cruise passengers with the idea that local communities would get a portion of it. At the time, the attitude of most Alaskans at the community level was that they held all the cards and if people wanted to come to Alaska, they (and the cruise lines) would just have to pay it. It didn't work out so well because the cruise lines reduced capacity, and it really began to pinch the state's capacity before the state made up with the cruise lines and the capacity was restored. Now the state legislature is considering setting up another confrontation, indirectly. The difference is that this time, if the ships leave, they probably won't be back.